Window air conditioners will keep your North Myrtle Beach vacation rental cool during the hottest beach temperatures of the year. And there is a sparkling blue swimming pool on site that is also refreshing. Relax in the comfort of your North Myrtle Beach rental’s living room or on the private balcony. Take a cat nap poolside on a comfortable lounge chair as you soak in the North Myrtle Beach sunshine. Walk across the street to the white sandy beaches and spread out a beach towel and get your favorite novel out of your beach bag. There are many ways to relax during your North Myrtle Beach vacation at A Place at the Beach I. This North Myrtle Beach resort also has a grill area on site. It is right next to the swimming pool and is a wonderful place to cook hamburgers and hot dogs or shrimp and fish during your North Myrtle Beach vacation. Sometimes dining in can be just as memorable as going out to eat during a family beach vacation. Laundry facilities are also on site at A Place at the Beach I. 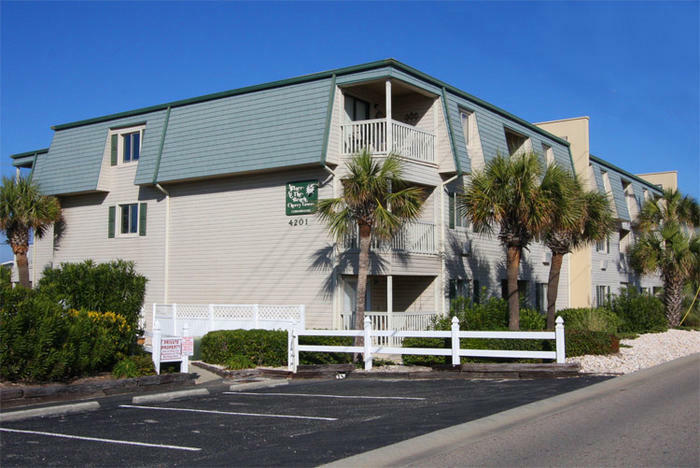 This North Myrtle Beach resort is in the popular Cherry Grove section of North Myrtle Beach, South Carolina. This area is special because not only is it a community that is on the oceanfront, but the salt marsh channels that weave their way into the residential neighborhood like alleyways make it most appealing to those who like to fish. The tranquility of the salt marsh is so evident in Cherry Grove and no other area of North Myrtle Beach, SC has this feature. There is also a fishing pier in Cherry Grove from which some record catches have been made. Try your hand at casting a line in the Atlantic Ocean and reeling in dinner. Or just walk the pier and watch the experienced fishermen fish away the day. North Myrtle Beach, SC is full of terrific ways to spend a vacation day and evening. Breakfast, lunch and dinner will be enjoyed at the area’s wide selection of restaurants. While seafood is pretty popular with many visitors, there are steakhouses, hibachi grills, all-you-can-eat buffets and 24-hour breakfast places in the area, too. Whatever your dining preference, the North Myrtle Beach area can accommodate you and your family. From fine dining at a waterfront atmosphere to a casual beach café where bathing suits are welcome, a North Myrtle Beach vacation can clearly be whatever you want when it comes to eating delicious food. Live entertainment theatres are scattered throughout the area. Award-winning shows, some that feature live animals, acrobatics and comedy, are extraordinary ways to spend an evening with your family. Kids love the shows as much as the adults and some of these theatres are even dinner theatres where you eat your delicious meal with your hands. The Palace Theatre hosts traveling Broadway shows and special productions while The Carolina Opry and The Alabama Theatre have resident shows that incorporate singing and dancing into a fantastic story line. Medieval Times and Pirates Voyage are the dinner theatres in town and Legends in Concert is an entertainment tribute show. Myrtle Beach golf is a popular pastime. The Myrtle Beach area has more than 100 golf courses and some are quite famous. From championship Myrtle Beach golf courses to par-3 golf courses there is a local golf course designed for you. Challenge your game by making a tee time for a renowned Myrtle Beach golf course. Improve your golf game by taking a lesson from a pro or first hitting the driving range. Amusements and attractions throughout the Myrtle Beach and North Myrtle Beach area cover a wide range of preferences. There are miniature golf courses that the kids will love. Shopping includes outlet malls and fantastic venues that also incorporate dining and entertainment. Water sports might be Sea Doo rentals, banana boat rides and parasailing. Try a water slide and venture on a roller coaster during your North Myrtle Beach vacation at A Place at the Beach I. Everything is nearby so your memorable beach vacation will also be one of convenience.